Within Spindle Professional Tools, users are able to setup email templates to create personalised, consistent and on brand emails. This allows you to further automate your business processes and give you valuable time to do what you do best. 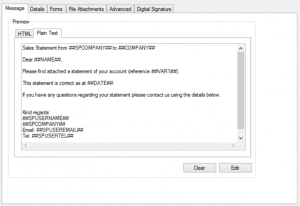 This blog will take you through the steps of setting up the email configuration for your automated documents. Hopefully, helping you to improve the way that your business works. Let’s work through your Email Setting Tabs individually. Under message header of the email settings, you can create a template email message for each document . This can be done in either plain text or HTML format. You are able to use ## commands for text variables. Allowing you to pull through specific information relating you the account or the person that you are emailing. For example you could use ##company## to include each individual company name. Alternatively, you can set up variables and have associated values with them. HTML allows you to create a more visually pleasing email layout with your company logo and some colour. It you are using HTML you will usually want to set up an alternative plain text version for recipients who are not able to receive HTML email. 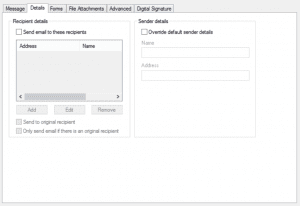 Within the email details, you can alter who the email is going to if you do not want it to go to the defaults and you can also override the default sender. 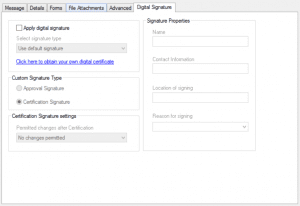 Email Forms allows you to choose the default form or terms and conditions that you attach to the email. This also allows you to apply a watermark to the attachment that you are sending out e.g. if it is a private document or a copy. 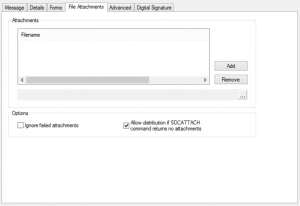 You can add attachments to the emails automatically. For example, if you are doing a promotion and you want to attach the flyer then you can specify the file location and then it will pick this up for you and send automatically. 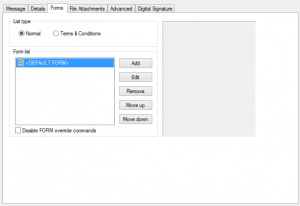 There are some more advance settings that you can apply to your documents. 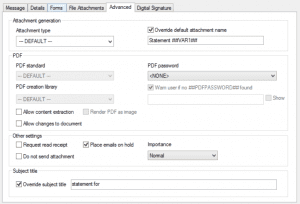 You are able to add an extra layer of security by adding a password to any of the PDF attachments. You are also able to use ##commands to set this so you could use their account number as the password. Here you are also able to setup read receipts, the level of importance, or place them on hold so that they go to your drafts rather than sending. You are also able to override the default subject line, this will allow you to personalise it with ##commands. An additional part of the security , allows the recipient to know that the senders identity has been checked by a trusted organisation. Also that the contents of the PDF has not been altered before the recipient opens it. The trusted status will be displayed with either a blue ribbon or a green tick. If you would like any help with Spindle Professional Tools, or are interested in what this may be able to bring to your business get in touch with one of our friendly team. If you would like more information on things you can do in Spindle check out our blog on Creating Fantastic Spindle Forms. Jake loves helping people, whether that’s solving your support queries or volunteering outside of work. He is ‘Mr Organised’, and can often be found keeping the support desk under control and the office in shape!